Kita of Pass The Sushi has organized this great group where she picks a few recipes from a cookbook for everyone to make. It’s a fantastic way of dusting off and cracking open all of those cookbooks we all own. I am so bad about buying new books to fill them up with post-it’s and then not doing anything with them. So I was really excited when I heard about the PTCBC because it would encourage us to cook from what we own. Anyway, the first book is The Pioneer Woman Cooks: Food from My Frontier by Ree Dummond. Perfect since, as usual, I had that filled with post-its bookmarking recipes I wanted to try. 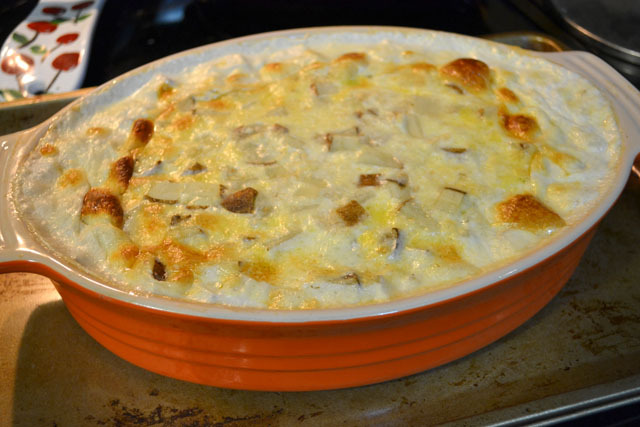 From three options we had, I decided on making the Perfect Potatoes Au Gratin. I remember my parents making it when I was young so I wanted to try it myself. I’m glad I tried it myself since it was super easy and made a great side for our dinner. It is a great side dish and I like that it has the possibility to take on a lot of different flavors so I can make a lot of varieties. When Ree says it will be garlickly she is not joking! 3 cloves of garlic!!! I love garlic so it was perfect for me and went really well with the pork cutlets I made with it. 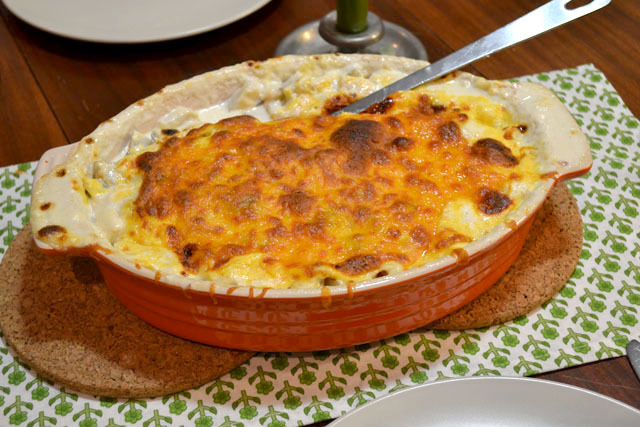 The potatoes are soft and flavorful from the creamy sauce and the cheese on top was so good. This is going to be making a regular appearance on our dinner table. I only made a few changes to the dish’s ingredients and cooking process. First I didn’t serve the side with the green onions just because I forgot them in the store. duh! I swapped the black pepper for white pepper because I love white pepper with creamy sauces. I increased the amount of milk because when I put the sauce mixture in the dish it didn’t cover my potatoes. Also, since it is 8 servings I knew we would eat the leftovers over a few days so I didn’t want the dish to dry out either. Lastly, I popped it under the broiler for a minute so the cheese would get browned and crunchy- which I love, so if you don’t want it to browned then just bake it and don’t broil it. Be sure to check out what everyone else made! If you love cooking then you should join Pass the Cook Book Club for some monthly cooking inspiration. 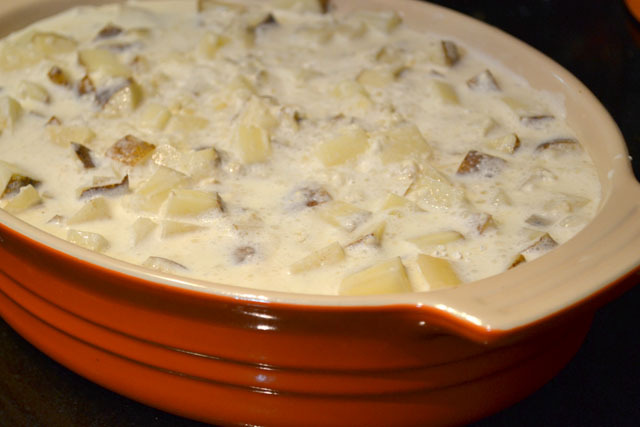 Preheat the oven to 400 degrees F. Prepare a 3 quart baking dish by buttering the bottom and sides. 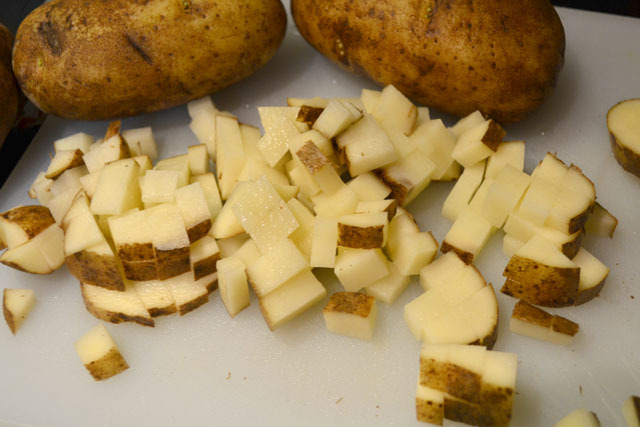 Slice the potatoes into sticks, then into a small dice. 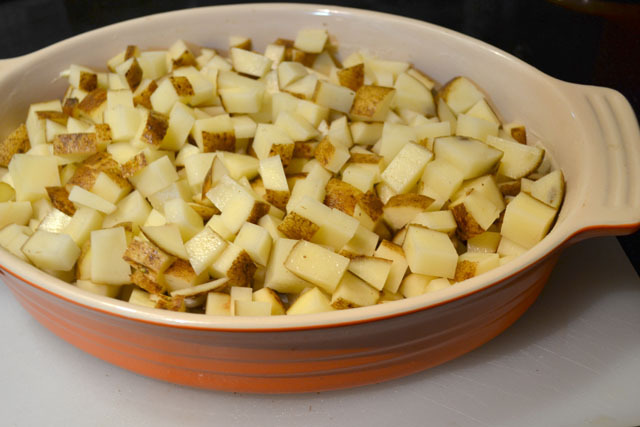 Place the potatoes in the baking dish. 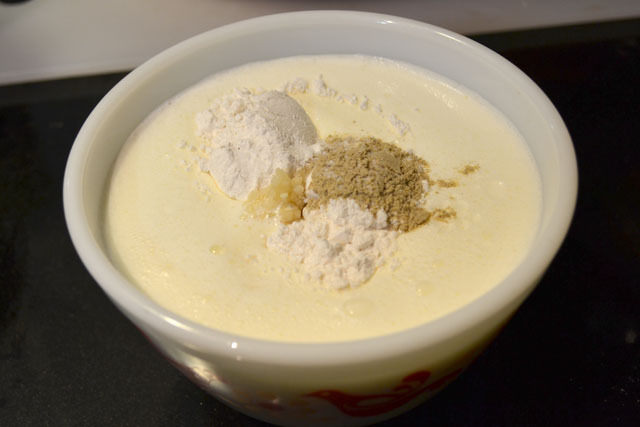 In a bowl, combine the milk, cream, flour, garlic, salt, and pepper; whisk to combine. Pour over the potatoes. Cover with foil and bake for 30 minutes. Remove the foil and and bake for another 20-25 minutes. 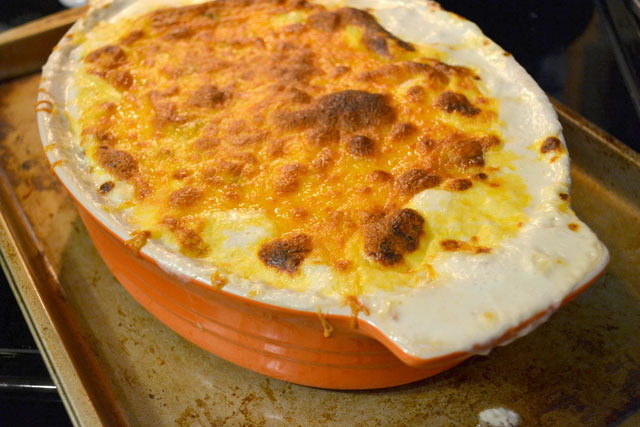 Just before serving, sprinkle with cheese and bake for another 3-5 minutes to make the cheese melted and bubbly. Serve hot and garnish with green onions, optional. oh and I was so close to making the pots de creme. I have that on the to do list, my timing was just off for something sweet in the house. I was also going to make this as my 2nd choice! It looks SOO cheesey..ooey good!! This was my second choice. I ended up making the pots de creme. I’ll definitely give these a whirl. I think I am going to have to make these potatoes after all. I thought I’d just make the chocolate and be done, but seeing all of the posts on the taters has me wanting some this week! Look at all the bubbly cheese on top! Yours look amazing! Yum, comfort food at it’s best, I made these too but yours look much more sinful! Oh wow the top of yours looks so much better than mine did. Are these potatoes not divine??? ?